Anyone who grew up during the 1980’s and remembered what it was like to see Gremlins as a kid knows what a welcome breath of fresh air Krampus is. It’s a movie that accomplishes making you laugh out loud and truly scaring you at the same time. On top of that, it’s actually a very well-made movie with a lot of old school craft mixed with new to not just be a nostalgic throwback to the monster movies of yesteryear, but also to be a clever piece of modern filmmaking as well. To be honest, I hadn’t seen nor followed any of the advertising for Krampus at all. I basically knew about the movie a couple of weeks before it was released. I had seen only a few people talking about it and I was kind of amazed that a movie like it was somehow getting a wide release. I mean, a Christmas horror/comedy that’s also a monster movie getting a huge release? So yes, as a fan of the genre, I felt that it was my duty to go out and support it. Being in a theater surrounded by both adults and children of various ages and watching the movie along with them let me know right away that the people behind the movie knew exactly what kind of audience it was going for, and it might not be what you might expect: families. That is, families with a sense of adventure. The advertising for this movie lets you know exactly what it is. It isn’t trying to pull the wool over anyone’s eyes like say... the advertising for Gremlins did. All of Gremlins’ advertising was centered around Gizmo, so imagine the surprise once people got into the theater and discovered themselves being dropped into, what is basically, a monster movie. That’s how Krampus felt to me, but in a more straightforward way. The movie tells the story of a middle class family with an estranged relationship to their visiting relatives... basically, your setup for a generic Christmas movie. During the festivities, the families begin feuding amongst themselves to such a degree that it causes the youngest boy in the house, in a fit of tears, to rip up his letter to Santa Claus and throw it out the window, surmising that their broken family has lost any and all Christmas spirit. Unknowingly, this summons the half-demon, half-goat legend Krampus who, according to folklore, comes to punish those families that have lost their Christmas spirit. Both comedy and horror ensues as Krampus sends his various minions into the house to both terrorize and enslave each family member one by one. Krampus was co-written and directed by Michael Dougherty, who had previously helmed the awesome horror anthology cult classic Trick ’r Treat. According to him, he had been greatly interested in folklore and local legends for years and when he learned about Krampus, he knew it would make for a great horror story. The movie also stars a variety of familiar faces, including Adam Scott, Allison Tolman, David Koechner, and Toni Collette. Besides the look of everything and the wonderful set pieces, there’s also some fantastic creature effects by Weta Workshop, as well as some amazing sound design, the latter of which was one of the best theatrical sound mixes I’ve heard in recent years. The opening title sequence of the movie featuring mobs of people in slow motion fighting for Christmas deals in a department story (set to classic Christmas music) lets you know that this movie is well aware of its sense of humor. The story itself might begin as a seemingly generic family dramedy, but it soon sidesteps into something completely different. This gives viewers a sense of depth to the characters as you begin to relate to them when everything starts going haywire. There’s also a nice mix of in-camera creature and special effects, as well as CGI monsters from time to time (the killer gingerbread men, for example). There’s even a creepy clown/jack-in-the-box worm-type creature that is probably the creepiest effect in the whole film. There are also visual nods to other movies as well, with National Lampoon’s Christmas Vacation probably being the most prevalent. 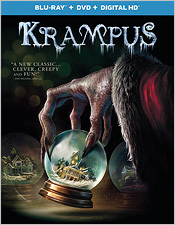 During the time of the movie’s theatrical release, there was also a glut of Krampus-related and other holiday-horror movies released at the same time, with all of them going straight-to-video. The good part is that none of them can hold a candle to Krampus. It’s a fun movie with just the right tone and the exact kind of filmmaking expertise behind it to make it one of the classics of the genre, of which I have no doubt it will be one day. I personally plan on revisiting it over the holidays. Why it wasn’t released on home video closer to Halloween, or maybe even Christmas, is strange to me; but alas, it’s nearly summertime, and here we are. The movie is presented via a digitally-shot presentation with a strong, organic-look. There’s excellent detailing and texturing on skin, clothing, and environments, even in backgrounds. There’s also stark uses of color, as well as consistent skin tones and deep black levels. Contrast is also excellent, but the movie always felt a tad too dark to me, even in the theater. I felt that some of the screen direction was a little lost at times, but it wasn’t a major problem. The presentation also exhibits some possible edge enhancement as it appeared too sharp at times, minor though it may be. There are no other signs of digital tinkery elsewhere that I could find. For the audio, there are several options to choose from, including an English 5.1 DTS-HD track, Spanish & French 5.1 DTS tracks, and an English 2.0 Dolby Digital DVS track for those who might need it. For the main 5.1 track, the amazing sound design that I experienced in the theater is wonderfully-recreated here. It’s a highly robust mix with activity in all speakers at all times. There’s very precise dialogue with a strong score and a fantastic use of sound effects including booming explosions and wonderful ambience. Low end moments also are abound throughout the presentation, so it’s definitely a soundtrack worthy of a home theater system. It’s wholly immersive and should give your system quite a workout. There are also subtitles in English SDH, Spanish, and French for those who might need them. For the extras, there’s a very nice assortment to dig through. They begin with an audio commentary with co-writer & director Michael Dougherty and co-writers Todd Casey & Zach Shields; an alternate ending; a set of 14 deleted and extended scenes; a set of Krampus Comes Alive! featurettes (Dougherty’s Vision, The Naughty Ones: Meet the Cast, Krampus and His Minions, Practical Danger, Inside the Snowglobe: Production Design) and a Behind the Scenes at Weta Workshop: Krampus featurette (all of which are Blu-ray exclusives); multiple sets of still galleries (Theatrical Poster Art, Creature Art, Story Art, Michael Dougherty Art, Storyboards); a DVD copy; and a paper insert with a digital copy code. The featurette material tends to lean more towards the promotional side of things rather than being immersive behind the scenes material, and the theatrical trailers and TV spots are absent, but overall, it’s still a very nice set of supplements. Krampus is the kind of horror/comedy that doesn’t come along too often, if at all. There are lots of bits to enjoy in this movie if you’re any kind of horror fan. It’s very much in the vein of a Tales from the Crypt episode, particularly with the ending that it has. It’s not that it’s a perfect movie, but it’s perfectly executed and presented for what it is: a tongue-in-cheek monster movie made for families, and its release on Blu-ray should satisfy most of its fans.